Winter 1963 / 64 was the first in the history of the tramway where there was no service over the majority of it. The only area to see any trams running on a regular basis was the line between Cleveleys and Fleetwood, where a shuttle service was in operation. There was also a daily special to / from Rigby Road in the morning / late afternoon. In December 1963, the North Station line was severed from the promenade route, when the junction was removed and the North Station tracks covered over with Tarmac. Bispham depot closed as a running shed, with all trams that were intended for further use transferring to Rigby Road or Blundell Street, which had reopened to replace Bispham and received a new entrance at the southern end. Bispham would linger on as a store for redundant trams for a few years. That winter was also a busy one for the workshops at Rigby Road with the 19 remaining Brush railcoaches being the main recipients of attention. Those that hadnt already done so, had their sliding roofs panelled over, the side destination blinds above the entrance removed, whilst also being re-equipped with English Electric Z4 controllers and half drop windows from scrapped series 1 railcoaches. The Coronations being relegated to seasonal journeys, with the remaining series 2 railcoaches, ex towing railcoaches and brush cars taking over the winter timetable. The North Station Service was replaced with a new service operating between Fleetwood and Tower, giving Fleetwood the same headway as had operated the previous year. of the Coronations would have a temporary reprieve after they had their troublesome Vambac control units removed and had conventional controllers from scrapped railcoaches installed in their place. Following a final tour of the system, Blackpool's last remaining Standard Tram, 147, bode farewell in 1966. The tram was sent by Cargo ship to America for preservation. It would not be the last that we would see of 147, however as it would make a return to Blackpool in later years. The fleet of the popular boat trams wasnt safe either as 1968 saw the scrapping of 4 redundant boats. These 4 boats had been surplus to requirements and had been held in storage since 1963, when the North Station Route closed. Following the installation of a computer system by Blackpool Corporation Transport in 1968, a renumbering of vehicles took place as the system could not distinguish between different types of vehicles. Most of these trams would retain and in most cases still retain these numbers for the remainder of their lives. Double deckers and illuminated trams in the 700 range. Not long after the renumbering of the fleet took place in 1968, Brush Car 628 became the first tram post renumbering to be scrapped following a serious collision with Balloon 726 in Fleetwood. The underframe of 628 would in 1973, become the basis of railcrane 260. Due to the rising costs of running the tramway and buses and the increasing wages bill, the Transport department decided that they had to find a way of reducing costs. A number of ideas were thought up and tried out on various fleet members. Brush Car 638 was converted for One Person Operation with the addition of doors at the front left position just behind the driving cab position. The drivers cab was fitted with a swivel seat to allow the driver to spin round to take the money. 638 was painted all over cream to distinguish it from the rest of the fleet. The experiment was not successful for many reasons and the car was later converted back to a crew operated Brush car. The next trial was carried out on Railcoach 611. 611's appearance was altered with its cab ends changed from the distictive pointed end shape to look more like a twin car towing coach and was fitted with plastic panelling to reduce the overall weight of the tram. Railcoach 618 was next, it was extended and was fitted with tapered ends to carry 56 passengers instead of 48. Following the experiments, it was discovered that One person Operation was the way ahead to cut the costs of running the tramway in the winter and spring. Blackpool, being the only remaining tramway in Britain at this time, would have struggled to find anyone willing to build new trams with out massive bills, so their only option open to them, was to experiment with and adapt the existing fleet. From 1972 until 1975 a fleet of 13 One Man Operated cars were built from the remaining EE railcoaches, with the exception of the Ex towing railcoaches and twin cars. The railcoaches were lengthened and tapered with new entrances built on the tapered ends with the centre doors retained as exits, also the original railcoach controllers were retained however were relocated so that the driver used their right hand to work the controller and left to work the brake instead of the opposite way around that was the norm on the rest of the fleet to allow the driver to be able to also handle money. The OMO trams would go on to operate the majority of the milage operated on the tramway until 1985 when the Centenary cars arrived and would not be totally withdrawn until 1993. The Brush Cars were also considered for conversion, however their lightweight framework meant that they were deemed unsuitable for conversion. The first few conversions took place using withdrawn, accident damaged or works trams. The reason for this was to allow as many railcoaches as possible to remain in service until there were enough OMO cars available for service. At the same time, Brush Car 624 became a permanent way car as it was in need of an overhaul to remain in passenger service. The final railcoaches to be withdrawn were 615, the last railcoach to remain in its original form, which became OMO 11, plastic tram 611 became 12 and 618 became 13 in 1976. Most of the OMO's were withdrawn with structural faults or when they reached a certain milage, with many of the trams developing severe droops in the bodywork, possibly caused by the bogies not being far enough out from the centre of the tram and remedial work had to be carried out fairly often. Withdrawals began with OMO 13, which ironically was the youngest OMO after only 8 years in 1984. OMO 13 had previously had its body extended when it was still railcoach 618 and it is thought that not many changes were carried out to this tram with the exception of a new entrance door at the cab ends and new cab layouts. OMO's 2,3 and 4 followed soon after with the underframes of 3 and 4 being stored at Thornton Gate yard for a number of years for possible reuse, however they have now been scrapped. OMO's 6 and 9 soon followed 2,3 and 4 in being scrapped. OMO 7 was rebuilt into a replica Vanguard tram, regaining its old railcoach number of 619 and saw use until 2004 before being stored then reactivated in 2007 before final withdrawal in 2009. 619 has since moved to Heaton Park Tramway in Manchester. 1 and 12 were next to be withdrawn and scrapped, with 8 being stored and 10 becoming a static Coffee shop in a conference centre in Reading. OMO 5 and 11 remained in use until 1993, when they were withdrawn from service and stored. In 1979 2 derelict balloon cars 714 and 725 which were withdrawn in 1971 in need of a total rebuild, were rebuilt and converted to one man operation receiving longer bodies, flat fronts and pantographs, 725 re-entered service in 1979 as 761. This car has a front entrance and exit door, and no centre exit doors which unfortunately makes the car slow in loading / unloading. 714 returned to service as 762 in 1982, it was built with centre doors as well as the front entrance doors to aid passenger flow. Both cars were later christened the Jubilee Cars. During the 1960's a number of the fleet began to carry between deck adverts and advert boxes fitted to the roofs of the single deckers, however this was to move a stage further in the 1970's with the development of all over advertisements. the First balloon to receive an overall advert was 707 with an advert for the Empire pools, whilst 622 became the first Brush Car to receive an all over advert, receiving the famous Tigeriffic advert for Blackpool Zoo (a CORGI model of this tram was released during 2007). 634 would later receive an all over advert in 1977 to celebrate the Queen's Silver Jubilee. When they first started to appear, all over advert cars were seen as a novelty and people would go out of their way to see them and travel on them. As late as 1998 most of the Balloons were still in fleet livery, however by the end of the traditional tramway in 2011 most of the servicable fleet carried all over adverts with only 600,604,632, 715, and 717 as well as the vintage cars carrying green and cream heritage liveries. In 1980 a serious collision caused by a set of incorrectly set points took place between Balloons 705 and 706 at Pleasure Beach. The result of this was 705 being scrapped after being stored in Blundell Street Depot for 2 years. Due to the demolition of Blundell Street depot, which had became unsafe following damage caused by gale forced winds, there was less space and all surplus and derelict vehicles had to go. 706 almost suffered the same fate as 705 but received a last minute reprieve, the tram had been towed out into the bus yard for scrapping when somebody suggested restoring it as an open topper. This quick thinking saved this tram and as a result it was converted back to an open topper in time for the centenary in 1985, 706 became the first tram to be named, it was named Princess Alice after a relation of the Queen Mother and Queen Elizabeth II, who officially unveiled the new tram at the Centenary parade back in 1985. At the start of the 1980's, plans were already well underway for the celebration of the Tramway's centenary. Councillor Parkinson, the Chairman of the Transport Committee, suggested that trams from other towns and cities across the country should be used to attact visitors to the event. The first tram to arrive was Bolton 66 in 1981. Bolton 66 had recently been restored and remains in Blackpool to this day. The tram is an 8 wheeled standard double-decker built by the Electric Railway and Tramway Carriage Company in 1901. The tram was originally an open-topper but was enclosed in 1932 retaining open drivers platforms. 66 was renumbered 366 in 1940, surviving the Blitz and was withdrawn from service a year after the end of the War in 1946. The lower saloon was sold as a caravan and the upper deck was scrapped. 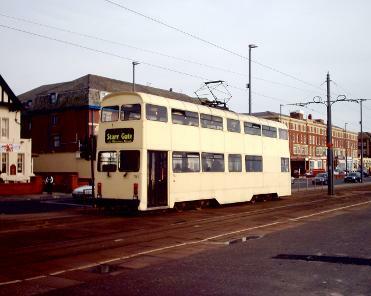 66 was rescued by local enthusiasts in 1964 and after the restoration which included the building of a completely new top deck built from wood salvaged from a Methodist Chapel that was being demolished and testing at Kearsley Power Station the tram arrived in Blackpool on 23 June 1981. Also in the 1980's the unique Brush Car no 638 that was converted to one person operation in the 1970's and later converted back to a crew car was withdrawn in need of an overhaul, it was deemed surplus to requirements and scrapped in 1984 in the bus yard. Another Brush car in need of an overhaul was Brush car 637, however it would spend 2 years as a dedicated driver training car before finally getting an overhaul and returning to service as an ordinary member of the fleet in 1990. In 1985, the first of the replacements for the OMO trams, the Centenary trams began to appear in service, also the GEC test tram (651) which was similar to the Centenary trams but with different electrical equipment also made regular appearances. 651 was later renumbered 648 and converted to a standard centenary car with the same electrical and control equipment. The centenary trams would go on to operate the bulk of the journeys carried out on the tramway until the end of the traditional tramway in 2011. 642 and 648 still run in Blackpool as part of the heritage fleet. The undoubted high point of the 1980's was in 1985 which was the Centenary of the Tramway and a year of events took place. The celebrations started with a mini Cavalcade of trams, flagged off by comedian Les Dawson on May 16th. Princess Alice was in town on 6th June to name newly refurbished open top balloon 706, bearing her name. 14th July saw the first Tram Sunday when the whole of the Main Street of Fleetwood was turned over to a display of vintage vehicles, something which has become an annual event that still takes place to this day. Also unofficially Brush Car 621, which was operating on the Fleetwood - Starr Gate service, found its way into the procession in between Balloon 726 and Bolton 66. It is quite fitting that one of the workhorses of the tramway eventually did feature in the parade. 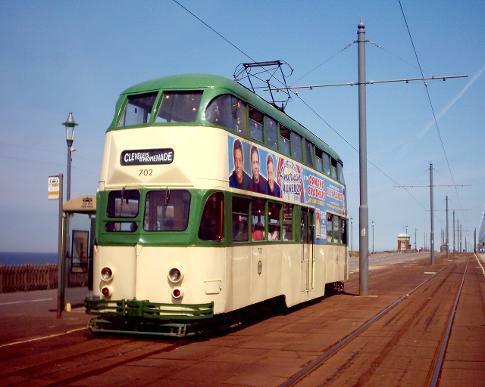 The Centenary year was also the swan song for Blackpool Corporation Transport as the tramway was operated by a new Company, Blackpool Transport from 1986.